When he got to Kuwait, he was ready to fight. He was ready to do some damage, to take out his frustrations. His commanding officer was Rupert and he admired him greatly. Rupert didn’t have the same problems with shyness that Jason Richard Wright often suffered from. No, he was a very strong and independent individual. Jason lead the two parents and daughter outside the house and into the alley, from which the two soldiers had come. Rupert drug the teenage boy out and plopped his unconscious body next to the feet of the parents. Rupert grabbed the girl by her left bicep and began to pull him along with him back to the house, the parents spoke up and began begging to spare the child. As the father stepped forward, warranting a threat, Jason Richard Wright struck him in the face with his rifle. The father fell to the ground, grabbing his bloody face. His wife tried to catch him as he fell, and wept loudly. Jason Richard Wright watched as Rupert drug, then carried the squirming young girl. He estimated that she was probably only fifteen years old. He was thankful she was developed, otherwise it would not have been near as pleasing–if pleasing at all. He waited and listened to the sounds. He could hear the violence of the act, the girl screaming and Rupert shouting out curse words in satisfaction. It was too much to bear, Jason Richard Wright had to see for himself. He made the parents take their shirts off and tied their hands and feet together, after tearing their shirts to work as ropes. He did the same for the passed out teenage boy. After instructing them not to move, or they’d die, he went up to the house and followed the noise around the house. Through a window, he could see Rupert had full control of the young girl in a bed. He watched for several minutes and was very much enjoying himself. In his mind he agreed, Yes, if you want a girl–take her. He was slowly becoming jealous and impatient, waiting his turn with the young girl. But the more he watched, the less he desired the girl. He thought of how she was already broken in and that she would be dirty, that by the time he had his way with her she would have already become accustomed to the idea and thus the adrenaline would be lost. The element of surprise and shock. And on top of that, she would be tired and exhausted, therefore it would be too easy. As he pondered these thoughts, he watched in horror as the bedroom door flung open and in entered the father and teenage boy with guns. They were screaming, Rupert cursed and flung himself from the bed hiding behind from the natives. The girl jumped outside the other side of the bed and ran out of the room. 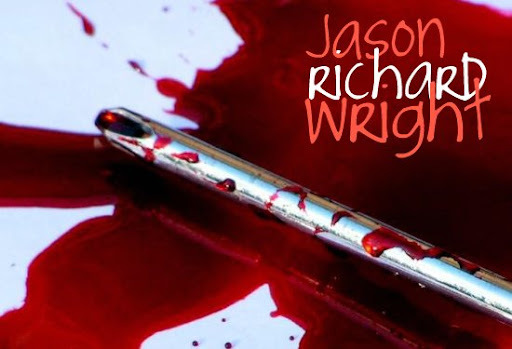 Rupert gripped his gun and began to take shots from the behind the bed, Jason Richard Wright ran around the house to the front door. As he reached he saw someone with a gun and he took aim and put anywhere from ten to fifteen bullets into the enemy. The body fell into the light of the open door and he saw that it was just a young child. A boy of about five or six years old. He froze in disbelief. He noted also that the child’s gun was actually a small stick. “You tied them up…” Rupert spoke hatefully. Rupert walked back into the house, Jason Richard Wright followed him. The mother held onto her dead husband, cradling him. Rupert put his gun to the back of her head and pulled the trigger, an eye rolled across the floor and stopped at Jason Richard Wright’s boot. Stepping over it, he entered the bedroom. The girl dropped her teenage brother, who she clung to and ran into the corner at the sight of the two soldiers. Rupert raised his gun and shot the girl. Finally, there was silence. Jason Richard Wright’s ears were ringing. Jason Richard Wright knew what he had to do. He lowered his gun, took off his belt. Later he would acknowledge that he was surprised how much he liked it.